You probably notice it most when you bend over or sit down— that fold of flab in your lower abdomen that you just can't seem to get rid of. The truth is, whether your belly fat sits high or low on your midsection, there's only one way to get rid of it — by eating less and moving more. To do that effectively, you need a targeted plan of action, including vigorous cardiovascular exercise and total-body strength training. When it comes to burning belly fat, not all cardio exercise is created equal. Sure, jogging every day for 3 miles at a moderate, steady pace will help you burn calories, but it's definitely not the best option for fat loss. According to a study published in Metabolic Syndrome and Related Disorders in August 2009, high-intensity exercise is more effective at burning abdominal fat — specifically -— than moderate-intensity exercise. Although there was no change in body weight, body mass index or overall body fat percentage among 18 overweight elderly participants, those who exercised at a vigorous intensity saw a significant reduction in a type of abdominal fat called visceral fat compared to those who exercised at a moderate pace. Visceral fat is one of the two types of abdominal fat, along with subcutaneous fat. While no type of fat is healthy in excess, visceral fat is especially hazardous to your health as it has been linked to increased risk of cardiovascular disease and type 2 diabetes. In theory, it sounds easy to just up your exercise intensity and watch the fat disappear. But for most people, vigorous exercise intensity is very hard to sustain for more than a couple of minutes. Warm up for 5 minutes by walking or jogging at an easy pace. Increase the speed of the treadmill until you are sprinting, and hold that pace for 90 seconds. Lower the belt speed to a fast walk or slow jog for 90 seconds. Repeat steps 2 and 3 four to six times. Cool down by walking at an easy pace for at least 3 minutes. An added bonus of HIIT is that it takes less time to get the same or better results in abdominal fat loss than traditional steady-state cardio, according to a review of research published in Journal of Obesity in 2011. You can do a HIIT workout on the treadmill, at the track, on a stationary bike, a rower, elliptical machine or even in a kayak on a lake. You can vary the length of your sprints versus recovery time to keep things fresh and interesting. The most important thing is to work at a high intensity during the periods of vigorous activity. During the work periods, you should be sweating, your breath should be deep and rapid and you shouldn't be able to speak more than a few words at a time. Building muscle is an important part of burning abdominal fat. Muscle mass takes more energy to maintain than fat, so your body burns more calories — even at rest — if you have more muscle. While abdominal exercises should be part of your strength-training regimen, they're pretty useless as far as burning belly fat goes. A total-body strength training program includes exercises to target all the major muscle groups: back, shoulders, chest, arms, abs, lower back, hips and legs. Aim to train your entire body two to three times per week. You can get an effective and time-efficient total-body strength-training workout and an extra dose of cardio using Tabata training. 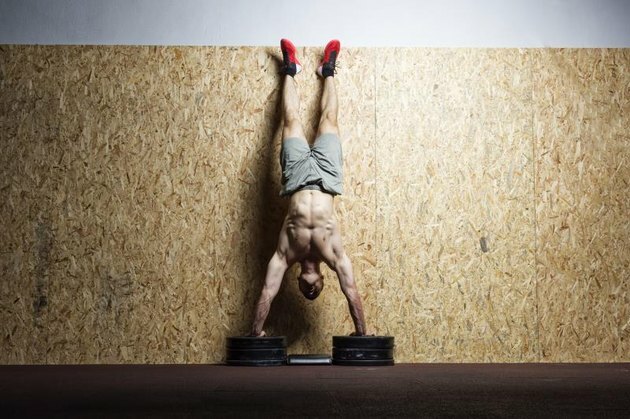 This type of training alternates 20-second periods of work with 10-second periods of recovery. To do the workout, set a Tabata timer, which you can download as an app to your mobile phone. You'll do eight rounds — 20 seconds of work, 10 seconds of rest — of each exercise. 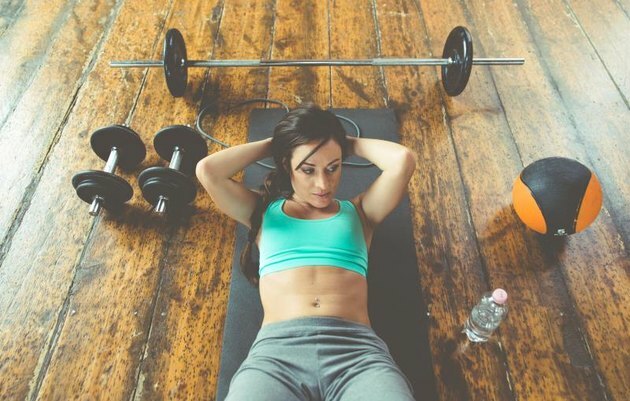 You can do all eight sets of one exercise before moving on to the next, or you can alternate through the exercises each set, like a circuit-training workout. Diet is a crucial part of ridding yourself of ower-belly fat. Stick to unprocessed, whole foods, such as vegetables, fruits, whole grains, lean meat, fish and low-fat dairy. Drink water or other unsweetened beverages and keep your intake of sweets limited to a treat every once in a while.